Life never gets boring for Eric Schilling. An engineer with a knack for consistently creating polished pop/rock, Schilling is also in demand for the savvy that he brings to jazz and Latin projects. Last year alone, he worked with Gloria Estefan, Julio Iglesias, Chayanne, Cachao, Arturo Sandoval and new artist Anthem, among others. He also took time out from the studio to mix the live broadcast for the Latin Grammy™ Awards, Celia Cruz's television special and the MTV Video Music Awards. Since 2000, Schilling has garnered three Grammy™ Awards, seven Latin Grammys, and in 2003, was honored at the Florida chapter of NARAS' Heroes Awards gala for his contributions to both NARAS and the state of Florida. His discography is impressive: 16 albums with Gloria Estefan — encompassing most of her greatest hits from “Conga” to “Live for Loving You” — and work with such other superstars as Natalie Cole, Jon Secada, Elton John, Natalie Imbruglia and Shakira. He's especially adept at bridging pop and Latin. Two of his Grammys were for “Best Latin Pop Album”: in 2000 for Shakira's MTV Unplugged and 2003 for Bacilos' Caraluna. A San Francisco Bay Area native, Schilling cut his teeth recording remotes for public radio station KPFA in Berkeley, Calif., then honed his chops at The Plant in Sausalito. There, he hooked up with legendary producer/engineer Bill Szymczyk (The Eagles, J. Geils Band, B.B. King), who brought him to Miami to engineer at his own Bayshore Studios. At the facility, Schilling began working with the as-yet-unknown Gloria and Emilio Estefan, a twist of fate that put him smack on the ground floor of the exploding Miami music scene. The rest — well, it's pop music history. Although Schilling now lives in Orlando, he still works primarily in Miami at his own studio and others. He also makes frequent excursions to New York to engineer for producer Phil Ramone. I spoke with Schilling one autumn afternoon by phone, when he took a break from mixing sessions for Juan Luis Guerra at Miami's Hit Factory. You started engineering when you were very young. From age 15 to 19, I volunteered at KPFA, a listener-sponsored radio station. It was a great experience because we did a lot of gigs in clubs — remotes — with a little console and homemade snakes. I learned about music and how to mix from those environments. We did everything: classical, bluegrass, rock and a lot of jazz. At the same time, I met Bob Ohlsson, who'd worked at Motown in its heyday. I worked for free for him just to learn. I got all my theory about microphones, compressors and recording techniques from him. What were some of the things you learned? Bob was taught, and he taught me, that before you crank a knob on the board, you move the mic or pick a different mic. At Motown, they used a lot of the same mics for everything; the Neumann KM 86 was their stock mic. To get different sounds, they had to work with placement. He also taught me a lot about microphone design. For example, he explained to me that when Neumann designed the U67, they rolled off the bass in it because it was meant for voice — to be used up close — unlike their older mics, which were designed for orchestral work. He taught me how changing from cardioid to figure-8 can alter a sound, making something a little brighter or more compact. How did you meet Gloria Estefan? I'd started to freelance when I was still working at Bayshore [Szymczyk's Miami studio]. But as it turned out, when Bill sold the studio, the last paying client to come through the door before it closed was Gloria. I'd worked on a Spanish album [for someone else] with producer Sergio Rozenblat, who she was working with. He called me to do her album, and we hit it off. I worked on “Dr. Beat” with her, which was a dance hit in Europe. That helped get her known. Then they — Emilio and Gloria — convinced their label to let them do an English album by offering to pay some of the cost themselves. That's how they got their English career off the ground; they took away the risk for the label. 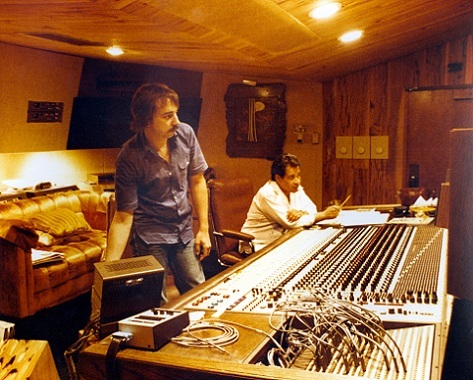 What do you think are some of the key elements of recording and mixing Latin music? First off, you have to bear in mind that “Latin music” is an extremely broad term. Growing up in the Bay Area, I was exposed to a certain type of Latin music — rock, like Malo or Carlos Santana. Here, the more I worked with it, the more I realized how many facets there are: Puerto Rican, Cuban, Dominican, Mexican and various South American styles; each one has a different cultural point of view. For example, the album I'm working on this week for Juan Luis Guerra, the style is merengue, which is extremely specific as to where you place instruments in the mix. You have to learn what the particular style is. Percussion is something most Latin records have in common. Would you tend to use room sound when recording it? In most Latin music, with the percussion being as dense as it is, I don't specifically put up mics for a room sound. Really, what you hear in those classic recordings that we call “room sound” usually wasn't something they got by putting out special mics for the room. It was that people were recording all in the same space. The normal bleed between instruments created the sound of the room. That's what I use, if I can. The only time I would put a person in a booth is if I know I have to replace a part [Laughs]. As for setting up mics for a big room sound, with so many people playing percussion, it would probably kill you! So what mics do you like on percussion? I use [AKG] C 414s a lot; [AKG] C 12s occasionally, if I can get a good one. On Gloria's records, especially for something like a suerdo — the big steel drum — I'd use a single C 12 or 414. If the conga player had two or three drums, I'd try to capture it with one mic. Believe it or not, I use the Sony 800G tube mic, which sounds really nice and bright when you get it three feet away. If you have a bunch of people in the room and you have to mike more closely, I'd use [Sennheiser] 421s on the congas. On Cachao's record, I ended up using a C 37 on congas, which is nice because it's bright and also really warm. But C 37s are very hard to find. Do you compress the instruments to help get a blend? No, I don't compress that stuff except when I mix, and even then I try not to do too much. That was a great project and great fun mixing it, partly because Al Schmitt and Armin Steiner, whose work I love, also worked on parts of it. For the songs I recorded, which were either a quartet or quintet, I took my Pro Tools and a bunch of mics and preamps to his home studio. How were the musicians set up? He has a big, live, tiled front room. That's where I put Arturo and the sax. The piano was also out there, in a sort of alcove. Horn players like to feel their horns in live environments; Arturo said that he wanted to play in the live room. Interestingly, I'd just gone through a phase of playing all these Rudy Van Gelder albums. I'd also been up at Phil Ramone's studio looking at a book about John Coltrane's album A Love Supreme, which Rudy did. The photos showed the piano, bass and drums all in one room with no gobos or anything. So I was already in that frame of mind. I did say to Arturo, “You can't fix anything. If you don't like your solo, you'll probably have to play the track again,” which he was fine with. He has a separate booth where we put the drums and a den/control room area that faces into the booth. The acoustic bass player sat in the control room behind me. When we tracked, we'd turn down the monitors and wear cans. A little Mackie for monitoring the output of the tracks, but all the mic pre's went straight into Pro Tools. Because of that, I recorded everything flat. It was a case of finding the right mic for the job and working on the source material — changing drums or adjusting the bass. The main monitoring was on a pair of old Klipsch speakers. They were okay, but I didn't know them that well. That's another reason I wanted to record everything flat. I figured if I got the sounds by moving the mics to where they sounded okay, I'd be safe. If I'm working on such consoles as a [Neve] VR or a [SSL] 9K, I'm not one who's got to have a special mic pre for everything. But in this case, I had to come up with a pile of preamps, so I got specific. For Arturo's trumpet, I used the new UA — new/old actually — tube mic pre. I chose that because he has a very bright sound that's hard to capture with any modern, really fast, transparent mic pre. A lot of the newer mic pre's are pretty good until you put them to the test of a guy like him, whose blowing is really loud. They just fold over. The UA didn't fold over. What trumpet mic did you choose? I used Royer 122s. I was really impressed. They didn't need pads; he stood maybe three feet away from them. For one piece, we brought in a trombone and a clarinet [as well as the sax], put them all in a circle and used Royers for the brass and Audio-Technica 4060s for the reeds. Did you compress the trumpet? No, I didn't have enough gear, and he's so consistent in his playing that I didn't need to. Did you record at a lower level than you would normally? No, we'd run the song through once and I'd learn where the peaks were. I'm from that school of knowing what your gain structure on a particular preamp is supposed to be. If you align your Pro Tools properly and set your mic pre's pretty much where they should be, you're probably going to be okay. I tried to set up the gain structure so that if he was playing a basic line, he was fine, and if he blew a solo, he had enough room to blow it and not peak. I used Great River preamps on the piano and on the bass. They're similar to a Neve design but a little beefier; a nice fat sound. I look for preamps that have a lot of headroom. Our NARAS chapter did a mic pre shoot-out awhile ago that was very enlightening. Some of them did really poorly, especially on drums. I think it tends to be a power supply problem, where there's not enough room in them and they just can't take level. For piano mics, I used Shure KSM32s; I'm very impressed with them. The stand-up bass was an A-T tube mic and a direct out. When I mixed, I used mostly the mic sound, because it was older-style music and they didn't want too much direct sound. Drum-wise, because I wanted a warm sound, we ended up using a Royer stereo mic on top of the kit. I used a couple of A-T 40s on the toms and I had this really funky little Sennheiser 604 — a tiny mic — that I used on kick and snare. With jazz, you have that boomy kind of kick, but you want a little bit of edge so it's defined. The 604 worked well for that. Besides your numerous albums with Gloria Estefan, you've also worked with other top vocalists, like Shakira, Jon Secada, David Bowie, Janet Jackson and Natalie Cole. What techniques do you use when you work with them? How do you decide what mics to use? I pick what I think is going to be a good blend between what their voice sounds like and what I know a mic sounds like. For Shakira, we started with a [Telefunken] 251, which is a really nice mic. But when she got loud, it was too bright. We ended up going back to an 87 [Laughs]. I know for a long time people have shied away from them, but they're workhorses; for many years, the British used them on everything and got really good sounds. The LA-2A if it's a good one. They vary so dramatically. Or I'll use a Tube-Tech CL 1B; that's pretty transparent, which I like. I don't do tons of compression on a vocal — maybe 4 or 5 dB on peaks. I'll do more riding. I used to, when I was cutting a live scratch vocal that I thought could be a keeper, use the [Compex] Vocal Stressor. With a dynamic mic, you could hit it really hard and it sounded great. Generally, I won't use any, unless there's a specific need. If you find the right mic, it will be close enough and you can touch it up in the mix. Also, if you've got to change rooms or move studios, it's a lot simpler. If I can get my hands on an EMT plate, that's great. But that's rare; hardly anyone knows how to tune them. My three favorites are the Lexicon 480, the AMS RMX — although more for drums than for vocals — and I just bought a TC Electronic 6K — the best piece of gear I bought all year! We set up Gloria's EMT 250 and the TC 6000 on its EMT program. I couldn't tell them apart. It's also a great box because if you're working in Pro Tools, the reverbs don't sound that good. You can go out to the 6K and stay digital. What's your personal studio like? I have a baby Sony Oxford console and a big HD rig that I feed into it. I refer to the HD as my boat because, like a sailboat, I'm always putting cash into it! The studio's control room is 16 by 17 and I have a pair of Genelec S30s with a sub. Originally, it was born out of a need to have a place to do my offline work: vocal comping, flying, tuning — all that stuff you don't need a big room for. Now I mainly use it for mixing. In today's market, it's really a necessity. Nowadays, some projects I want to do don't have the budget to go to a large studio. I have two HDs; one is smaller and more portable. That came out of the sessions at Arturo's home studio, where it took three guys to haul my 5-foot-high Pro Tools rack! I have one I/O with 16 inputs — which for any basic production is generally fine — a laptop and a relatively compact rack with a bunch of mic preamps. I have a self-contained little cue box from Hear Technologies, with either four stereo or eight mono mixes. It runs on Ethernet, so it's very simple to loop around. It works surprisingly well. I've only had to put an external amp on the back of it when I've worked with drummers who need to hear things really loud. I also have a really neat 8-channel mic preamp by Crane Song. It has A-to-Ds on all the outputs that can feed into anything AES. It has a mixing bus also, so if you want to combine some of the mic preamps, it's extremely clean. What do you look for in equipment that you're going to buy? My outboard rack is mostly compressors. If I'm going to compress something, I want to hear the character of my compressor. I want coloration. I just bought a Chandler EMI stereo compressor, which I really like. It's very aggressive and colored. For drum stuff I want to smack pretty hard, I have a bunch of Distressors, which I like because they have lots of rations and you can change them to sound like an opto or a FET device. I've bought a bunch of the new Universal Audio gear, which I've compared to the old pieces and found to be really good. I bought a new black-face 1176, and it's just a little cleaner than the old ones. Your overall mixes often have a really nice sheen to them. How do you get that? I believe that you instinctively have taste that leads you to a certain place in all things that you do, and I think I have a pretty good ear for pop. Obviously, the concept of what is pop changes all the time, but I just naturally hear that kind of structure. When I'm mixing, I like to hear bottom in a certain way that's kind of whole and round, and I like to hear some air and openness on the top. It's not that I won't compress, but I don't like to squeeze the life out. Basically, I'm always heading toward that place that I like [Laughs]. On a Mackie, I'd have to do it differently, but I'd still head to the same place. This may sound funny coming from me, because I'm kind of a gear junkie and I love new technology, but it's really not about the equipment. It's about how you hear. Forced to work in a stripped-down environment, as long as I can hear what I'm doing, and the acoustic room is good, I can do all right. Article/Interview by Maureen Droney, published in Mix Magazine 2004. Eric Schilling at Bayshore Recording Studios in Miami, FL circa 1979. Photo courtesy of Eric Schilling. Do you have content or pictures, to add, of Eric Schilling? Do you just want to say "Hello!"? Please feel free to Share it, here!